Luciano Pavarotti, Cavaliere di Gran Croce OMRI (12 October 1935 – 6 September 2007) was an Italian operatic tenor, who also crossed over into popular music, eventually becoming one of the most commercially successful tenors of all time. He made numerous recordings of complete operas and individual arias, and established himself as one of the finest tenors of the 20th century. He was one of "The Three Tenors" and became well-known for his televised concerts and media appearances. Pavarotti was also noted for his charity work on behalf of refugees and the Red Cross, amongst others. Pavarotti began his professional career as a tenor in 1961 in Italy. In 1961, he made his first international appearance in La traviata in Belgrade, Yugoslavia. He sang in opera houses in addition to Italy, in the Netherlands, Vienna, London, Ankara, Budapest and Barcelona. The young tenor earned valuable experience and recognition while touring Australia at the invitation of soprano Joan Sutherland in 1965. He made his United States debut in Miami soon afterwards, also on Sutherland's recommendation. His position as a leading lyric tenor was consolidated in the years between 1966 and 1972, during which time he first appeared at Milan's La Scala and other major European houses. In 1968, he debuted at New York City's Metropolitan Opera as Rudolfo in Puccini's La bohème. At the Met in 1972, in the role of Tonio in Donizetti's La fille du régiment he earned the title "King of the high Cs" when he sang the aria "Ah mes amis ... pour mon âme". He gained worldwide fame for the brilliance and beauty of his tone, especially into the upper register. He was at his best in bel canto operas, pre-Aida Verdi roles and Puccini works such as La bohème, Tosca and Madama Butterfly. 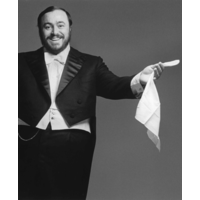 The late 1970s and 1980s saw Pavarotti continue to make significant appearances in the world's foremost opera houses. Celebrity beyond the world of opera came to Pavarotti at the 1990 World Cup in Italy with performances of Puccini's "Nessun dorma", sample (help·info) from Turandot, and as one of "The Three Tenors" in their famed first concert held on the eve of the tournament's final match. He sang on that occasion with fellow star tenors Plácido Domingo and José Carreras, bringing opera highlights to a wider audience. Appearances in advertisements and with pop icons in concerts furthered his international celebrity. His final performance in an opera was at the Metropolitan Opera in March 2004. Later that year, the National Italian American Foundation (NIAF) inducted him into its Italian American Hall of Fame in recognition of his lifetime of work. During a ceremony held at the Foundation's Anniversary Gala just four days after his 69th birthday, singer Faith Hill presented Pavarotti with a birthday cake and sang "Happy Birthday" to the opera legend. The 2006 Winter Olympics in Turin, Italy, saw Pavarotti on stage for the last time, where he performed "Nessun dorma", with the crowd serving as the aria's chorus, and he received a thunderous standing ovation. On 6 September 2007, he died at home in Modena from pancreatic cancer, aged 71.